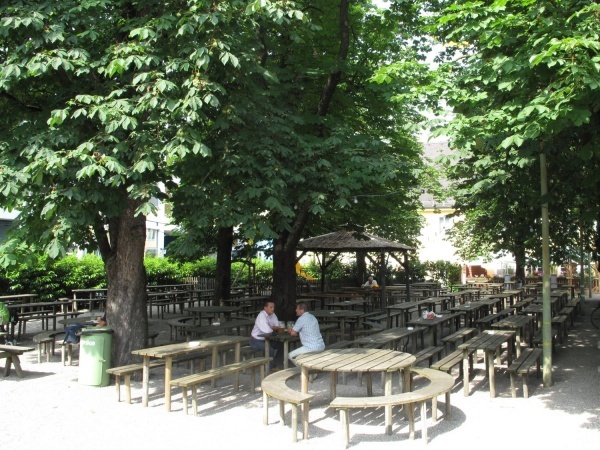 The Brauhaus Bruck beer garden is located in the centre of Fürstenfeldbruck, 25 kilometres west of the central Munich. 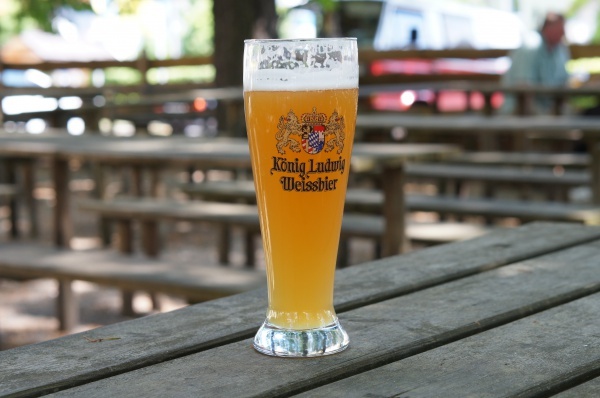 Just next to the beer garden is the Kaltenberg brewery, which in addition to the Kaltenberg beer also brews the König Ludwig Weißbier and Dunkel. The beer garden exists since 1840 and was originally created as the summer beer cellar for the Marthabräu. Today the beer garden has about 600 seats in the self-serviced area. Guests can sit on traditional fixed to the ground wooden tables and benches. Large chestnut trees provide the necessary shade on a warm, sunny summer day. The serviced terrace is much smaller and shaded by large sun umbrellas. The self-service food stalls offer typical Bavarian beer garden meals, such as Wurstsalat (sliced sausage salad), Obatzda, Schweinsbraten (roast pork) and Bratwurst. Guests can choose between four types of beer: Hell (lager), Dunkel (dark lager), Weißbier (wheat beer) and Kellerbier, most of them tapped fresh from the barrel. A Maß Kaltenberg Hell (lager) costs €6.00 (April 2013). In addition to the restaurant in the main building and the beer garden, Brauhaus Bruck has a separate banqueting hall for festivities of up to 500 guests. This hall was built in 1925 and is under monumental protection since 1991. Depending on the weather, the Brauhaus Bruck beer garden is open daily from 11am to 11pm. This page was last modified on 18 May 2018, at 19:02.